Dosimetry of internal emitters has been one of the most widely studied topics by the health and safety research community. Thanks to the availability of radiopharmaceuticals from the research reactors of the Department of Atomic Energy at Trombay, the practice of nuclear medicine has been growing steadily over the past 50 years. In phase with this, there has also been a large increase in the number of nuclear medicine physicians, technologists and medical physicists. There have been significant research contributions from the scientific community in the area of radiation protection. But, surprisingly, there has not been a single text book-like publication on internal dosimetry from India readily available for medical physicists and nuclear medicine technologists keen on honing their skills in radiation dosimetry. The DRDO should be commended for its laudable efforts to bring out a monograph on such an important subject. 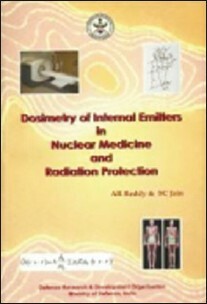 Both the authors, Dr, A. R. Reddy and Dr. S. C. Jain, in view of their long and rich experience in radiation dosimetry, are eminently suited to handle the complex topic. This is an interesting monograph of eight chapters spanning nearly 300 pages. The topics of the chapters follow a logical progression of the subject. The monograph begins with an introductory chapter giving a lucid overview covering all aspects of internal dosimetry, which will benefit in particular the non-dosimetry professionals in the nuclear medicine field, like physicians and technicians. The core of the book starts in Chapter 2, with a very detailed description of the framework and basic model for computation of absorbed dose due to internal emitters. Beginning with a detailed description of the historical Marinelli-Quimby-Hine formalism, the chapter discusses in detail features of the Medical internal radiation dose (MIRD) and International commission on radiological protection (ICRP) schema for dose estimation. International efforts, in particular those of the European Commission, toward harmonization of methodologies for internal dose assessment are listed with relevant references. Physical and biological data inputs required for internal dosimetry are respectively dealt with in Chapters 3 and 4. The techniques employed to obtain biokinetic data and the importance of biokinetic data studies in particular for the development of new radiopharmaceuticals are very well described. The authors discuss in great detail the differences between ICRP Reference Man and Indian Reference Man in the anatomical, physiological and metabolic parameters and their impact on the calculation of health detriments due to radiation exposure from internal emitters. Despite commendable work carried out over the years, both in BARC and DRDO, it is intriguing that the formulation of the Indian reference man is yet to receive regulatory approval. Chapter 5 deals with the evolution of dosimetric phantoms, starting with MIRD/ICRP definitions of age-dependent male/female reference persons. While the early phantoms were described in terms of geometric shapes like spheres, ellipsoids, elliptical cylinders, etc., later, the organs of reference persons were defined in terms of combinatorial geometric equations. Thanks to the availability of the 3-D imaging techniques like computed tomography and magnetic resonance imaging, etc., tomographic models or voxel models have been developed that will have a clear advantage over the other models for certain exposure situations like accident conditions. The authors discuss with sufficient breadth all these recent models that are aimed at accurate assessment of patient's dose, particularly in therapeutic practices, and it is very important that the medical physicists are kept informed of these models. Chapter 6 pertains to the most frequently used methodology in the dose computation, namely the Monte Carlo techniques in dosimetry. Starting from the very basics of random number generation, the chapter is treated so well with the help of several rightly chosen examples, case histories and highly illustrative figures that the readers will find them immensely useful for practical applications. The salient features of many widely used Monte Carlo packages and error reduction techniques in dose computation are important sections in this chapter. Chapter 7, titled Dose Estimations in Normal Practices, the largest chapter of the monograph, deals with a variety of important aspects of dosimetry in nuclear medicine. How Monte Carlo techniques are extensively used in nuclear medicine imaging is dealt with several examples. One such example is the 3-D image data-based patient-specific dosimetry programme. In this scheme, one uses image fusion techniques for anatomical quantification from Computed tomography (CT) and Magnetic resonance imaging (MRI) and physiological/functional or biokinetic information from SPECT- and PET-based tomographic images. Dose distributions and dose volume histograms generated from such schemes are very useful in optimizing a therapeutic treatment plan. The section on targeted radionuclide therapy gives a fairly descriptive account of the practice itself in addition to the dosimetric aspects for treatment of a variety of cancer cases. Particular attention has been given to the calculation of exposures to dose-limiting organs like kidney and bone marrow. Kidney dosimetry in peptide receptor radionuclide therapy (PRRT) is indeed complex due to the rapid transit of the radioactivity through the urinary tract with non-uniform distribution necessitating a multi-region modeling of the organ. Authors have given very detailed presentation on how to compute the biologically effective dose (BED) to the organ. Yet another important aspect dealt with is the computation of dose to embryo or fetus due to the intake of radionuclides by pregnant mothers. The section on "Dosimetry of Internal Emitters at What Level" is once again an excellent exposition on the topic, with the examples of dose computations due to Auger electron emitters in cellular and sub-cellular structures of the target organ. Understanding the uncertainties in dose estimates is a challenging task, and the monograph rightly includes a long discussion on myriad factors contributing to the uncertainties. A noteworthy feature of the discussion is the quantification of these various uncertainties. A document on internal dosimetry cannot be complete without dealing with the safety-related recommendations of the ICRP. As one of the authors (ARR) is an ex-member of an ICRP Committee, an authentic and historic account of ICRP recommendations forms an important part of the monograph. The final chapter 8 titled, "Dose Estimation in Practices Related To Emergencies/Disasters" has indeed very little to do with internal emitters. The chapter deals with practical management of radiological emergency like decontamination, accident dosimetry and countermeasures like administration of prophylaxis. Such information will be of great use to medical physicists required to handle radiological emergencies of various types. The authors have performed extensive literature survey and have provided a long list of references on all the topics. Particular mention must be made of the two useful appendices at the end, which catalogue the entire reports of MIRD and publications of ICRP. In summary, the subject of internal dosimetry has been effectively covered in this monograph in a comprehensive and clear manner, starting from the basics like interaction of radiation with matter and ending with the most recent dosimetric models, which take advantage of the state-of-the-art diagnostic tools like CT, MRI, PET, etc. Some of the commendable features of the monograph are that it has a large number of worked-out examples, case histories, practical problems, comparative evaluation of different schemes, very good illustrations/figure s and a large list of references. Clearly, it will serve as an excellent text book very well suited for use in courses like PG diploma or degree in radiation protection, medical physics, radiation physics or nuclear medicine technology. I hope the publication of this book will inspire someone in the Department of Atomic Energy to bring out a similar publication on internal dosimetry with a focus on nuclear fuel cycle operations.